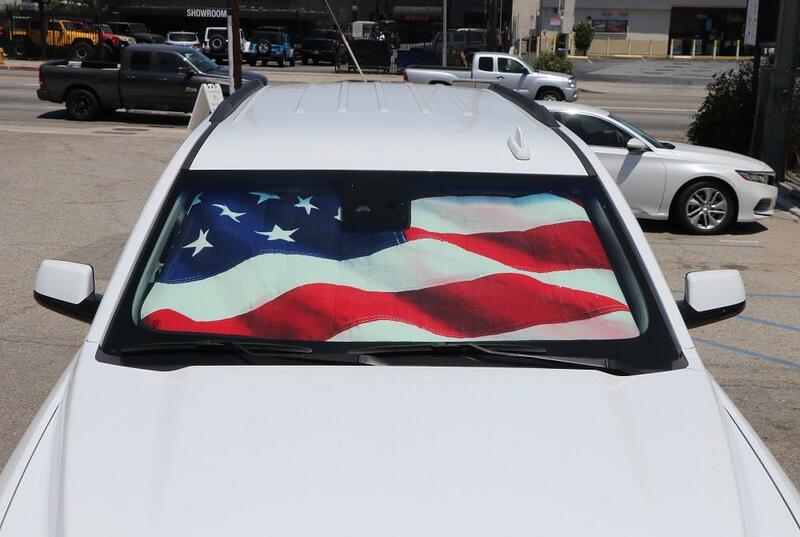 Intro-Tech Custom Fit USA American Flag Auto Shade Windshield Shade | Protect Your Interior from UV Damage | Custom Windshield Sun Shades for Sale | California Car Cover Co. This is a custom item. You will be notified of estimated ship date. 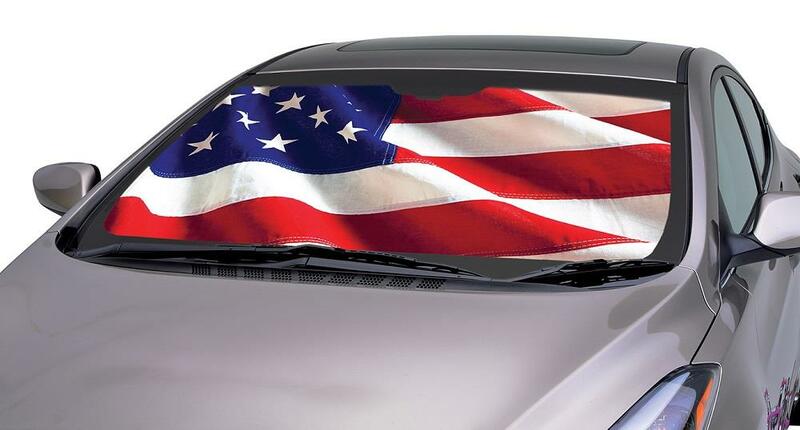 Keep your cool with a Patriotic Intro-Tech Custom Fit Rolling USA American Flag Auto Sun Shade. 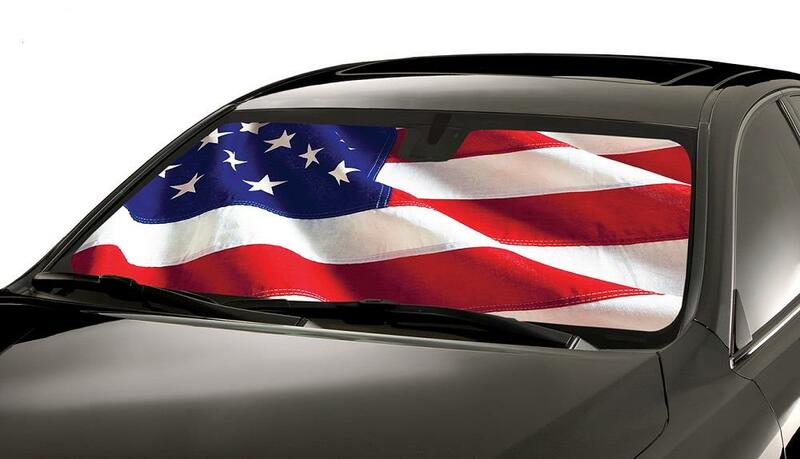 With over 2,300 applications, each sunshade is custom made for your specific vehicle to provide a precise fit. The highly reflective materials protect your interior from UV damage and keep the interior cool and comfortable (no more touching a scorching hot steering wheel!). Each custom shade is finished with a super-soft velour binding and features and sewn-in Velcro straps for compact easy storage. 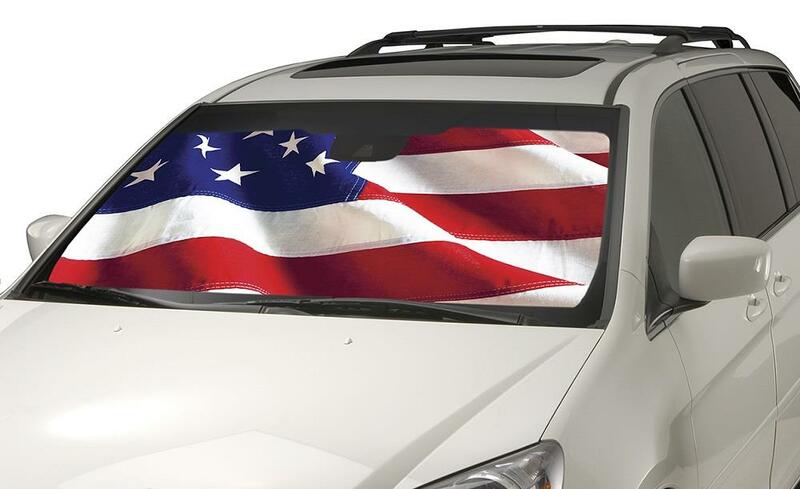 The Patriotic Intro-Tech USA American Flag Custom Fit Auto Shade Windshield Shade has a 3-D style image that is applied directly to the sunshade, with a clear protective coating to prevent fading. In the shade itself you will see shadows, 3-dimensional wave, and the actual stiches in the flag! When the summer heat intensifies, nothing is worse than getting into your car and encountering the sweltering temperature that's been building inside. Even on days with moderate weather, your car can become a hotbox if the sun's rays are allowed access to your windshield. How do you keep your car cool and protect it from thermal threats? 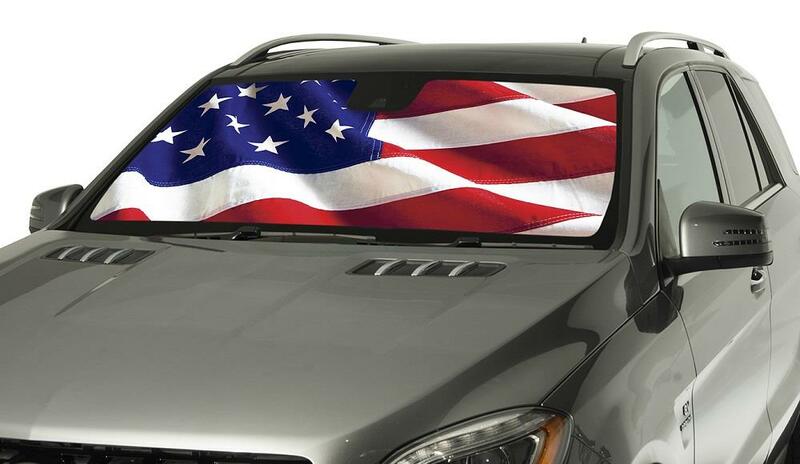 A custom fit car sun shade shields your car's interior from the penetration of UV rays. If our ready-to-ship selection does not have the auto shade you are looking for, invest in a custom sun shade visor crafted just for your car and its specific needs. You already know that a shade cover will keep your car's interior cool and prevent it from overheating. A windshield shade cover can also protect your car's interior from the damage UV rays cause, keeping your upholstery and console in great condition for longer. Think about what happens to anything that is left in the sun for too long—it fades, warps and cracks. The same is true of the materials found inside your car. When you protect them with the shade, though, you can enjoy both the beauty and functionality of your auto interior without worry of any UV rays' damaging impact. Should I Choose Folding or Rolling? With folding and rolling options available in an array of designs, we can help you find the right sun shield for your car. Typically, shades are either silver or gold as these hues reflect sunlight most effectively. You can choose the design that you prefer, and you will also find yourself choosing either rolling or folding. What is the difference between these two—and which is better? As the names suggest, a rolling visor simply rolls out underneath your windshield, and a folding visor folds into several panels. Your preference depends on what kind of car you have and which fits in its windshield more conveniently. For tailor-made protection, consider a custom fit windshield shade in either a rolling or folding style.